Today instead of Photo Share Tuesday, you finally get some updates on the nursery. To say that it’s been difficult is to say nothing. Aside from the fact that we only have weekends to work on it, I have been strictly forbidden to even enter the room while the work is in progress. In addition to that, my husband is the kind of guy who would rather buy pretty things than make pretty things. I am not a crafty person either, but I am a creative person, so I have all these ideas and visions and I want them to come to life at minimal cost (lol). So here we have one prospective parent who can’t work on the nursery (yes, we do buy low-VOC paint, and no, we still don’t feel it’s ok for me as a preggo to paint or be in the room that is painted) and another parent who really would rather postpone it till 2 weeks before Alexis arrives. So while I gotta give him props for calmly going and doing all these things I ask, my husband does tend to stop working an hour or two later, citing one of two things: “It’s a good start” or “I need a tool I don’t have to get it done right“. In the end, he always did get it done and worked really hard, but not without a lot of complaining and excuses . Let’s just say my husband is great at a lot of things, but he is not one who enjoys working with his hands rather than his brain (and to be completely honest I’m exactly the same way). Our biggest challenge so far is that the room is tiny. 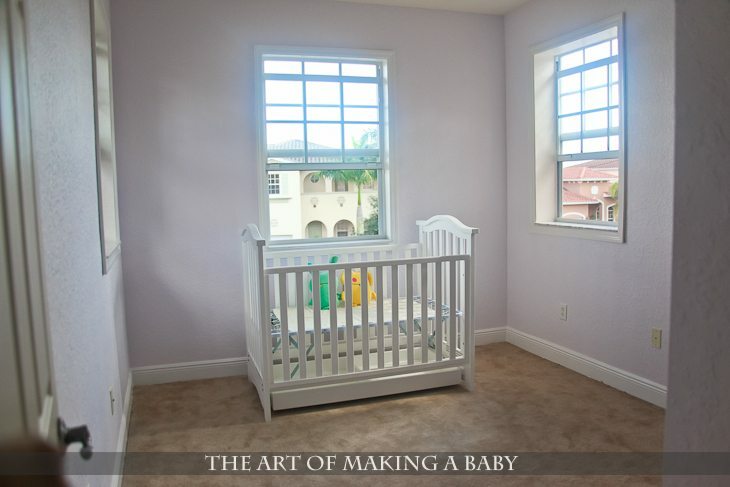 It’s not closet tiny, like I’ve seen some rooms be, but it’s the smallest room out of the 5 bedrooms and it was “meant” to be a nursery. All our other bedrooms have a pretty permanent use: master bedroom, movie theater, home office and a downstairs guest room. They are too specialized to easily convert to a baby room, and guest bedroom is downstairs which is too far from master bedroom. The only reason I am ok with Alexis having a smaller room is that we have a living room area downstairs that is currently a “mismatched furniture placeholder”, which I will convert to a playroom (photo on the left). It’s a large area and it’s going to look fabulous as an arts, crafts and play room for Alexis. So her bedroom will only be a place to sleep, not play. Once she grows up enough not to need a playroom or want more privacy, we’ll transfer her to the secluded guest room, which as a teenager she will love. 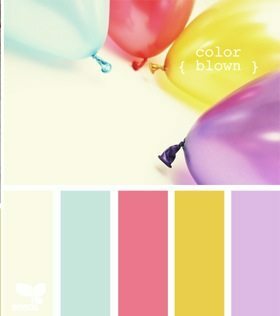 Our two primary colors, besides white, are lavender and soft yellow, with accents of muted, dark pink and aqua. Sort of like the palette below. We knew the walls were going to be lavender, but we weren’t sure how lavender we wanted to go until I decided on this palette. With so many colors in play, the walls had to stay subdued, so we picked out 2 lightest lavenders and got sample cans of them. Andrew painted two small areas with each paint and we gave ourselves a few days to decide. So while we weren’t sure about this little hunch of ours, we decided to go with it and paint the room the lighter color and then repaint it with darker if we end up thinking it’s just way too light. Once the room was done and allowed to dry, we absolutely fell in love with the muted light lavender. It doesn’t overpower the small room and keeps things fresh and bright. After the walls were finally done (we ran out of paint once), Andrew started working on fancying up those plain windows. The simple solution was to put casings around them. It was an easy job ( hehe of course- I didn’t do anything), but did take some time. Luckily Andrew had dome crown molding in the past, so he had the tools to make the cuts and a better skill level. He then spray painted them white and that was it. Next went the baseboard painting which turned into a disaster, since in some places the baseboard goes so deep into the carpet you can’t reach it. So a day of work wasted, since we’ll have to completely re-do them. The paint colors we used are Olympic Iris Isle and Sugared Shortbread. We wanted to get a fancier crib, but after some thinking I vetoed spending $1000 on the crib we liked, because it seemed silly and I wasn’t sure what all the expenses for Alexis and her room would be, so it was better to play on the safer side money-wise. Travis, of course, was the first one to check out the new room and new furniture. And it actually turned out even better, because my FIL was the one who bought us the crib. And while it’s not super expensive, I am still happy with the crib we got: it simple but nice and most of it will be covered with the awesome bedding my sister is sewing. 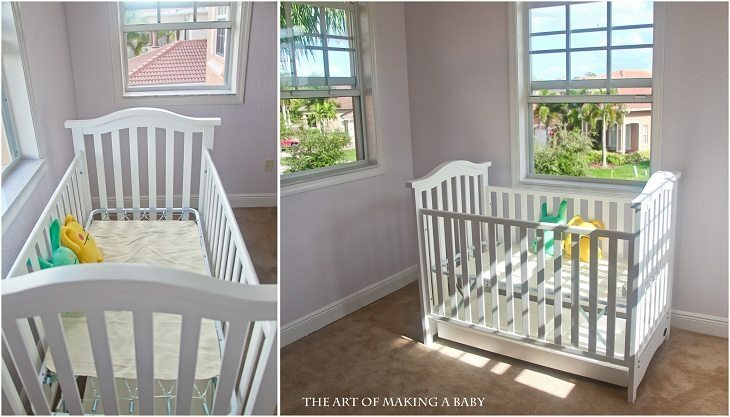 Besides, we were completely limited with the type of crib we could get, due to the fact that the nursery has 3 (!!!) 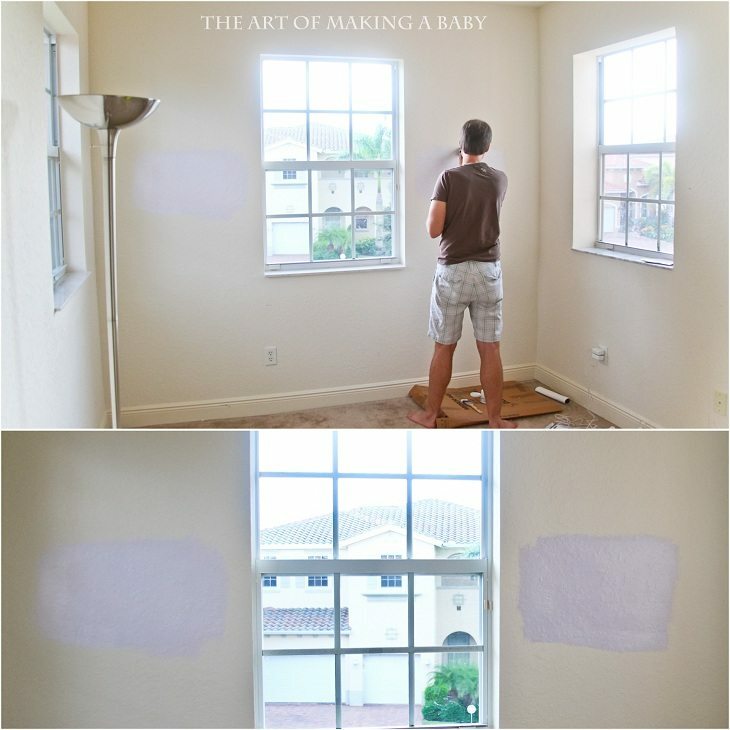 windows, which meant any crib with a solid back was out, since the back would cover some of the window regardless of where we’d place it. So side to side crib was our only option. I am waiting til Black Friday to buy a mattress ( just like a lot of things), since we want to get an organic one and those suckers run $300 bucks (I’ll be writing about it in the next few weeks). 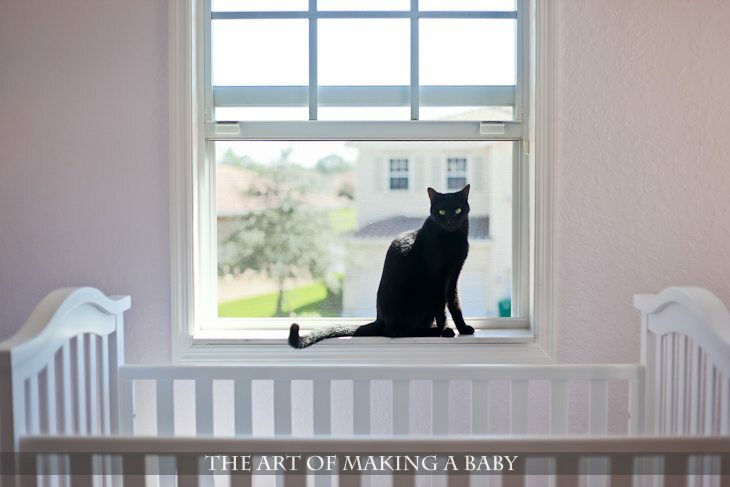 We haven’t completely decided on where exactly we’re putting the crib, so the main window is where it’s at right now. The little monster things you’re seeing here are UGLY DOLLS and even though I am waiting to buy the little decorative stuff for the room until the big furniture is finished and moved in and I have a better idea of where we’re at and what we’re doing, I couldn’t resist these two and snatched them off a Zulily sale. And they fit the decor colors we mapped out, so that’s a bonus. So that’s as far as we have gotten with the nursery. I hate the generic cream outlet plates and the horrible mustard smoke detector ( who thinks of putting a mustard colored smoke detector into a completely white room? Are mustard smoke detectors really that much cheaper that builders find it more profitable to use them? ), so we’ll have to swap those. Also waiting on the Black Friday sales are the white cordless roman shades. As much as I love flowy curtains, that’s just not safe in a baby‘s room with 3 windows where we have no choice but to put the crib by one of the windows. The work on the dresser has already started. I couldn’t find the dresser I had envisioned for less than $1200 ( and in wrong colors, too), so the next best thing is to refinish an old one. This is a dresser we bought off of craigslist for 100 bucks ( I swear, a dresser is the easiest thing to find there. I’ve been waiting on a perfect chandelier to buy and re-finish it and there’s been nothing even close to the simple chandelier base I need). I don’t have a good photo of the dresser and nightstand set, just the iphone snapshot I took when we bought it. Andrew already started stripping it and it’s an awful lot of work, because whatever finish it has, it doesn’t come off easily. So I see quite a few weekends spent on that project. I will try to remember to snap photos of the progress to post later. Once done, it’ll be painted white with yellow handles. In the meantime, while A is slaving at the dresser, I have a few projects of my own that involve wood and fabric. We’ll see how well they will turn out, but I’m not holding my breath. My sister is sewing a crib set that will look somewhat like this but in lavender. My mom will bring it with her when she comes in January so unfortunately, we won’t get to see it till then. Just a quick note: we’re not planning on having the bumper like in the picture. While I love the look of this bumper, I told my sister to make it very thin, not pillowy and in the beginning Alexis will most likely be sleeping in the co-sleeper and for the times when she sleeps in the crib, we’ll remove the bumper completely until suffocation is not an issue. The bumper will be thin enough so she won’t be able to pull up on it when she’s older either. 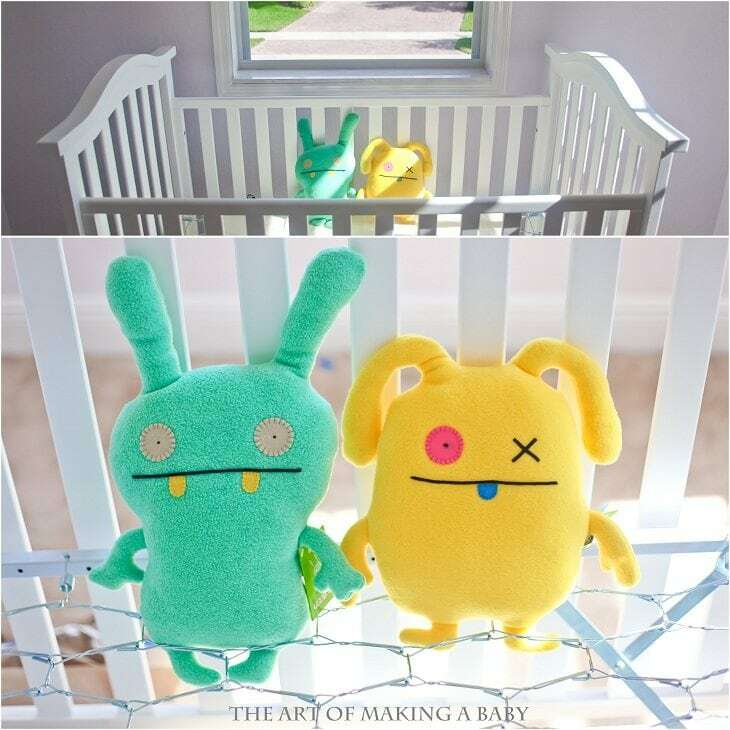 I already have one of the canvas for the walls and an adorable mobile from Etsy, that I will be showing you guys in the next Nursery Update Post. That is it for now. I am waiting to buy a lot of things until Black Friday sales and until the big pieces are finished and placed in the room so that I can assess exactly what I need to get. I cannot wait to start buying colorful pillows and art work and shelving, toys and books and make this room bright and colorful and a real baby girl’s room. So are you going to turn that guest bedroom into Alexsis’s room when she’s a teenager? You probably already figured this out, but there are tools specifically for painting baseboards… it looks like a big blade and you use it to pull the carpet fibers away from the wall. Just go to Lowe’s or wherever and tell them you need a carpet shield for painting baseboards. I recommend not getting the cheap flimsy ones, get one that is sturdy plastic. Oh thanks! We didn’t know there are ones specifically for that, but we were going to buy a flexible thin metal board and do the same thing. Will definitely check it our at Lowes. thanks again! You’re concerned enough to not have any curtains and to buy an organic mattress but you’re essentially putting pillows all the way around the crib? The bedding is very pretty but very impractical when it comes to the safety of a baby. What pillows?I’m not sure the pillows you’re talking about…. Do you mean the thick bumper in the crib bedding photo? There will be no pillows or blankets in the crib, and the bumper will be a skinny thin breathable bumper ( not one of those pillowy ones). One of the reasons I didn’t buy this set ( besides price) and my sister is sewing it herself is the ability to make a thin flat bumper instead of the pillowy one. really? maybe you’re just seeing the little matress cover I placed there and that’s what is throwing you off? Love the colour and texture! Im addicted to lavender in decoration. Cant wait to seee next part!!! Love, love, love, Elena!! It’s coming along so nicely. Your sister sounds super talented, and what a wonderful keepsake for Alexis from her aunt! 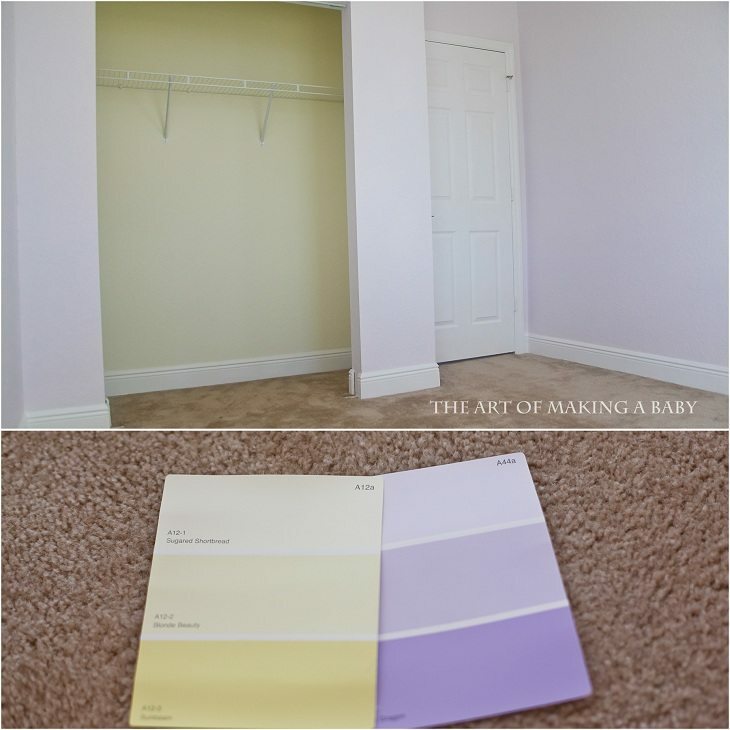 I really love how the yellow paint in the closet looks with the lavender room walls. That was an excellent idea! I’ll be thinking of you tomorrow for your glucose testing. I really disliked that part of pregnancy, and any other that included needles :S Oh, and that last picture of you, Alexis and Andrew is great!! Whoa, I don’t know why it has all the numbers, but this is Meegs… I’ve commented before. lol. Cuz it’s through Google friend connect? I think you can change that in your account. Yeah, i wasn’t planning on having my sister make the puffy bumper. Just a thin flat one. I’ve looked at breathable bumpers before and it’s definitely something I’m going to keep in mind. Most likely what’s going to happen is by the time Alexis gets out of the co-sleeper and into the crib at 5 months, suffocation won’t be an issue (I gotta look up when softer bumpers are ok again). I should probably put a note in the post that I won’t have the pillowy bumper like on the pic, otherwise I think everyone will assume we’re going for the exact crib set. Thanks for the concern though- it’s always appreciated. Yup, I read the same exact advisory a few months ago and came to the same conclusion. I don’t expect her to sleep in the crib until she can roll over anyways, so that’s not going to be an issue, and the bumper will be flat enough that she won’t be able to step on it to climb out of the crib once she does get transferred into the crib. Though breathable bumpers are completely safe, they’re too thin to cause suffocation- so it’s the best of both worlds. It looks so cute and happy! I love your colour scheme. Kudos to your husband for refurnishing that dresser! I refurnished our dressers and night stands last fall and it seriously took FOREVER – between using so many pieces of sandpaper (Thank God for the electric sander or else I would have died. Well, not really but it would have been even more frustrating) and it being so cold and damp that each layer of stain took 2 – 3 days to dry. I hope yours takes much less time than that! LOVE the nursery ideas! It is so refreshing to see a girl’s nursery that isn’t pink. Just wondering, but if you have more kids will they share that nursery, or will you convert one of your other rooms? The nursery is way too small for 2 kids to share, that’s for sure! I almost think it’s too small for one more or less grown kid. So we’ll definitely convert one of our other rooms for the older kid and keep this one as nursery and then play it by ear. Luckily we have enough bedrooms, we just would like to keep them the way they are, but will do whatever we have to to make room for our kids. Do you have a basement? That would be perfect for your office and such! Oh no! Sorry to scare you…you will likely be just fine! 🙂 I think part of it for me the first time was that I was only 14 weeks and still getting morning sickness. Good luck! Hahahah! Yeah i thought that it was bad for you cuz of 14 weeks. I would have definitely thrown up had I done it at 14 weeks! Mine went fine, it wasn’t pleasant but it didn’t kill me. Oh wow Melody! Thanks so much!!!!!! I’ll definitely look into it! I haven’t even heard that toxic gases are thought to be the culprit but it makes sense. I just wanted an organic mattress so that my baby was exposed to as few chemicals as possible in the beginning but this puts a completely different perspective in it, a tangible benefit for buying an organic mattress or the cover you recommended. FYI – The AAP just recently recommended to use absolutely no bumpers at all. My daughter is about a year, and we’ve been using a mesh bumper – but after reading this, we took them out and threw them in the garbage. I LOVE the nursery so far! 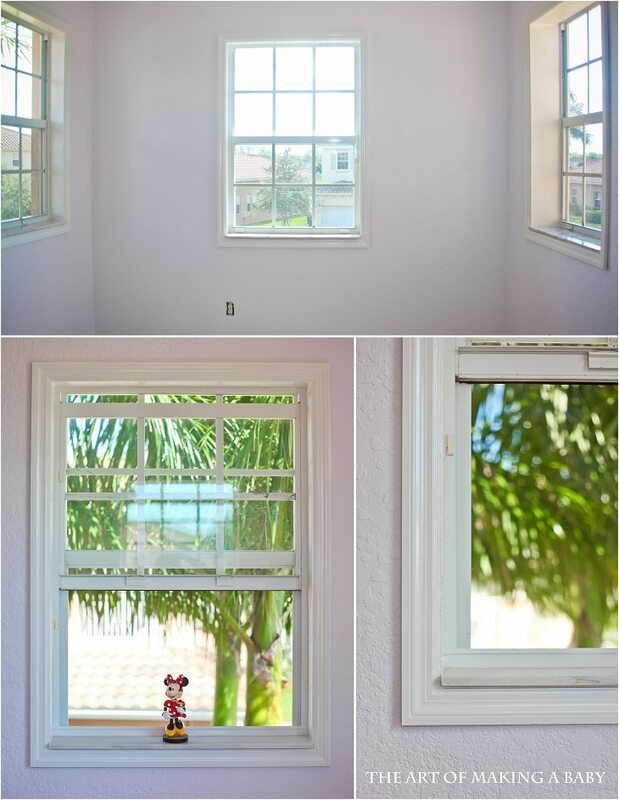 Those windows are gorgeous, and she’ll love all the sunlight. Love the lavender color. 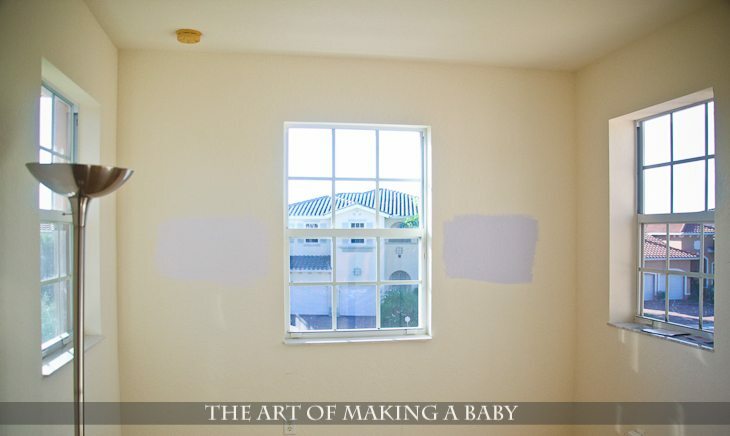 Our nursery walls are a pale yellow and our accents are pale blue, lavender, and pale green. Ha ha! 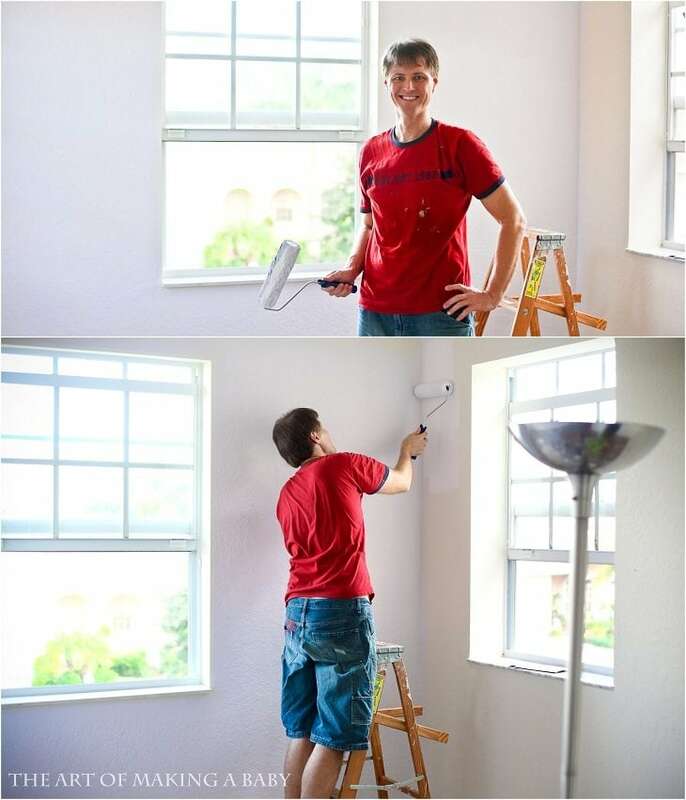 Josh was the same way…he wouldn’t let me help painting (we used low VOC) either, but I was itching to do something…my nesting instincts were off the charts! This is making me want to do an updated nursery post on my blog…I never got as far as the actual reveal, just some sneak peeks. Funny thing is, Lillian still isn’t living in her nursery! By the way, I replied to your comment about the cloth books, but in case you didn’t get to see it, we got them at amazon.com. Can’t wait to see which ones you pick out. You should DEFINITELY do a full nursery post now that it’s complete! I have a 13 month old son, he knows how to climb and open doors and windows already. I would never feel comfortable with him so close to a window. Please at least get the guards. Luckily, these are already kid proof windows. There’s no way a kid, let alone a baby or toddler, can open one. I have trouble opening them. Plus we have a few months before we have to worry about baby proofing. So worse comes to worst, we’ll baby proof them further when times comes. 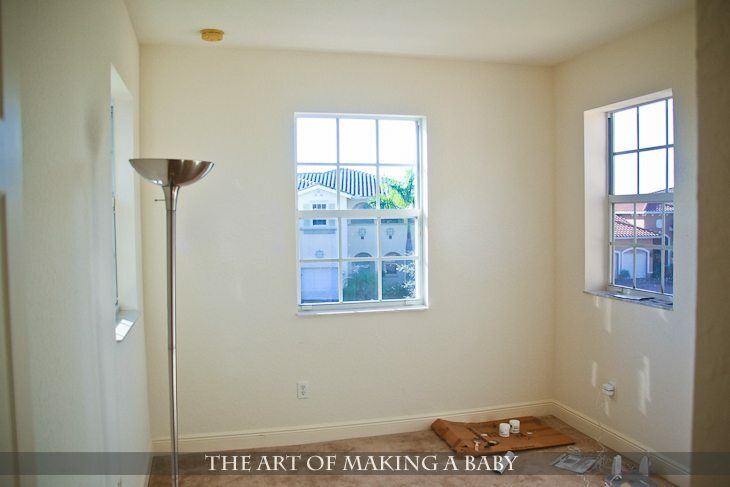 All the other bedrooms, besides having a lot of windows as well, just aren’t a good fit for a nursery. Move the crib. Seriously. Also, the issues with toxic gasses in mattresses and a correlation to SIDS are very well documented. The mattress cover sounds amazing. But please move the crib. You would be floored by what a child can do that adults cannot. Little fingers are much more skilled than we think. It’s physically impossible for a kid to open those windows. It has two latches that need to be pressed at the same time and pushed up while pressed in order to open the window. A toddler’s arm span is not long enough to grab onto them, push them up and push the window at the same time. And you have to put enough force to push it up- I have to call my husband to open them sometimes. Of course, we won’t just rely on this, we’ll do some kind of window proofing once she’s closer to being able to pull up. I got to use the bumper I had for roughly 2 weeks. My newborn was super squirmy and would squirm her way over to the bumper so it came out. I agree to not even bother with it. 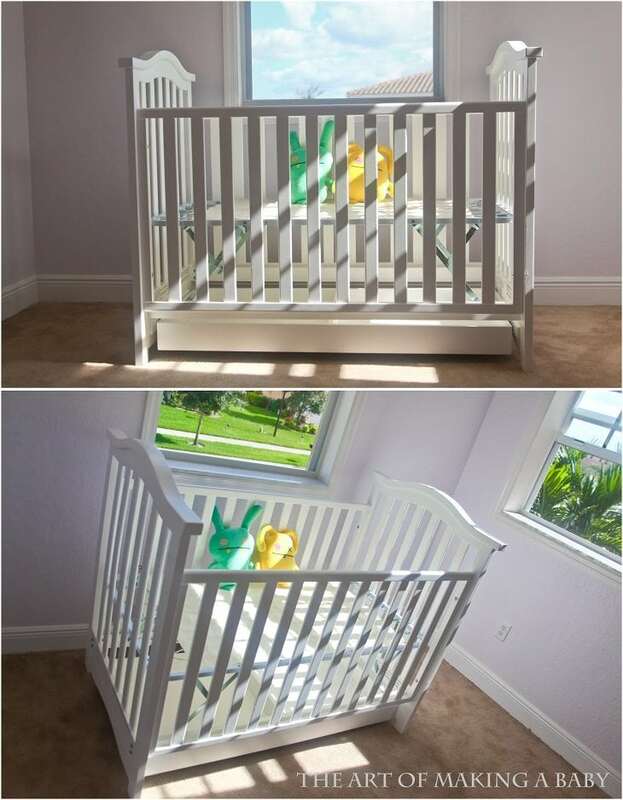 Its a pain in the behind to remove and put back in (which is what you were describing doing if/when she uses the crib) and you end up having to find a place to put it when its out thats not in the way. I saw that you had a plug on the one wall (with no window) I would highly recommend that you get these http://www.toysrus.com/product/index.jsp?productId=3747468 versus the stick in kind. My 9 month old (at the time) figured out the stick in kind and was able to pull them out (I couldnt but he could….). I know you have a minute for serious babyproofing but if you install them now (versus later) you dont have to worry about doing it and you get used to using them. I love the colors that you’ve chosen and the white crib! The windows are great, but some babies cannot sleep with light (like mine) so you might want to get black out shades. Once we got them, our slept so much better! Definitely! I’ve already picked out the shades and just waiting on better sales to buy them. They’ll be white but with black out lining, so hopefully that’s going to be enough. I love your colors and how bright the room is! We are also expecting our first baby in a few months. I have been looking around for an organic mattress and there was nothing under $300 so I’ve been waiting for a good sale. I just picked on up for our little one on the way and thought I’d pass along the deal. I called the company last night before buying it and they confirmed that no chemicals are added and they have an organic cotton and organic wool cover that comes with it. Haha! Same thing here. I’ve been waiting for naturepedic to go on sale but nothing. I did see greenbuds and my husband and I spent a few hours discussing and researching the company and their mattress. However, after going back and forth we decided to still buy naturepedic due to the fact that both latex and wool are well known allergens and according to naturepedic website, doctors advise children to stay away from them. I’m not so concerned with wool really since I’m planning on using a wool mattress pad but I do know people can be highly allergic to latex. So I personally don’t think it’s such a big deal since the baby wouldn’t come in direct contact with latex but my husband wanted to stick with no latex just in case. So if he’s ok paying 100 bucks more, I’m ok too! Thanks for mentioning it though! I really appreciate it! The first thing I bought for our girl was an ugly doll, too! I love them!